Pomona, Calif. – Doug Kalitta ran his career best elapsed time to lead Top Fuel qualifying Friday at the 57th annual NHRA Circle K Winternationals at Auto Club Raceway at Pomona. Due to weather, only Pro Stock was able to run both rounds of qualifying. Rain began halfway through the Funny Car second session before NHRA officials concluded racing activities. Matt Hagan (Funny Car) and Greg Anderson (Pro Stock) were also qualifying leaders in their respective categories at the season opening event of the 24-race 2017 NHRA Mello Yello Drag Racing Series. In the only Top Fuel qualifying session, Kalitta piloted his Mac Tools dragster to a 3.697-second pass at 325.69 mph to head into Saturday’s qualifying in the No. 1 spot. Brittany Force holds the second spot with a 3.706 at 322.42 in her Monster Energy dragster, eight-time champ Tony Schumacher and his U.S. Army dragster are third with a 3.729 at 325.06 and rookie Troy Coughlin Jr. is fourth with a 3.730 at 322.81 in the SealMaster dragster. Hagan led Funny Car with a 3.840 at 330.15 in the first session of qualifying in his Mopar Express Lane/Rocky Boots Dodge Charger R/T. Courtney Force with her newly sponsored Advance Auto Parts Chevy Camaro qualified second with a 3.849 at 330.23 in the first session and Tim Wilkerson and his revamped Levi, Ray & Shoup Ford Shelby Mustang jumped from 13th to third with his second round run of 3.857 at 322.65. In Pro Stock, Anderson powered his Summit Racing Equipment Chevy Camaro to a 6.557 at 210.60 in the second session to lead the category. Anderson’s teammate and defending world champion Jason Line followed with a 6.563 at 210.93 in his Summit Racing Camaro during the second session and two-time world champion Erica Enders, who is back in an Elite Motorsports Chevy Camaro ran a 6.567 at 210.60. Top Fuel — 1. Doug Kalitta, 3.697 seconds, 325.69 mph; 2. Brittany Force, 3.706, 322.42; 3. Tony Schumacher, 3.729, 325.06; 4. Troy Coughlin Jr., 3.730, 322.81; 5. 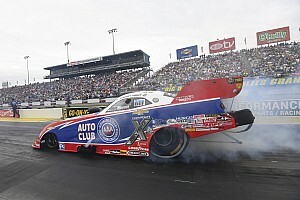 Antron Brown, 3.732, 323.27; 6. Terry McMillen, 3.824, 322.88; 7. Scott Palmer, 3.853, 321.50; 8. Troy Buff, 3.913, 309.98; 9. Clay Millican, 6.129, 100.05; 10. Steven Chrisman, 6.585, 112.67; 11. Steve Torrence, 6.796, 91.62; 12. Leah Pritchett, 8.835, 67.47; 13. Shawn Reed, 10.061, 45.19; 14. Steve Faria, 11.049, 68.68. Not Qualified: 15. Terry Haddock, broke. Funny Car — 1. Matt Hagan, Dodge Charger, 3.840, 330.15; 2. Courtney Force, Chevy Camaro, 3.849, 330.23; 3. Tim Wilkerson, Ford Mustang, 3.857, 322.65; 4. Alexis DeJoria, Toyota Camry, 3.932, 304.94; 5. J.R. Todd, Toyota Camry, 3.936, 329.42; 6. Del Worsham, Camry, 4.043, 298.80; 7. Bob Bode, Charger, 4.142, 285.29; 8. 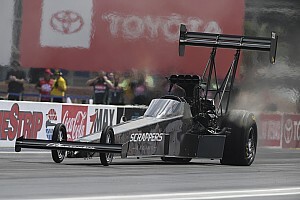 Jack Beckman, Charger, 4.153, 295.14; 9. Ron Capps, Charger, 4.158, 325.14; 10. John Force, Camaro, 4.247, 313.00; 11. Jim Campbell, Charger, 4.451, 219.79; 12. Phil Burkart, Charger, 4.470, 280.66; 13. Jeff Diehl, Toyota Solara, 4.564, 187.94; 14. Robert Hight, Camaro, 4.699, 232.67; 15. Tommy Johnson Jr., Charger, 4.723, 183.97; 16. Gary Densham, Mustang, 5.823, 129.49. Not Qualified: 17. Jeff Arend, 7.702, 89.45; 18. Cruz Pedregon, 13.651, 67.16. Pro Stock — 1. Greg Anderson, Chevy Camaro, 6.557, 210.60; 2. Jason Line, Camaro, 6.563, 210.93; 3. Erica Enders, Chevrolet Camaro, 6.567, 210.60; 4. Bo Butner, Camaro, 6.570, 210.60; 5. Shane Gray, Camaro, 6.573, 210.50; 6. Jeg Coughlin, Camaro, 6.577, 210.21; 7. 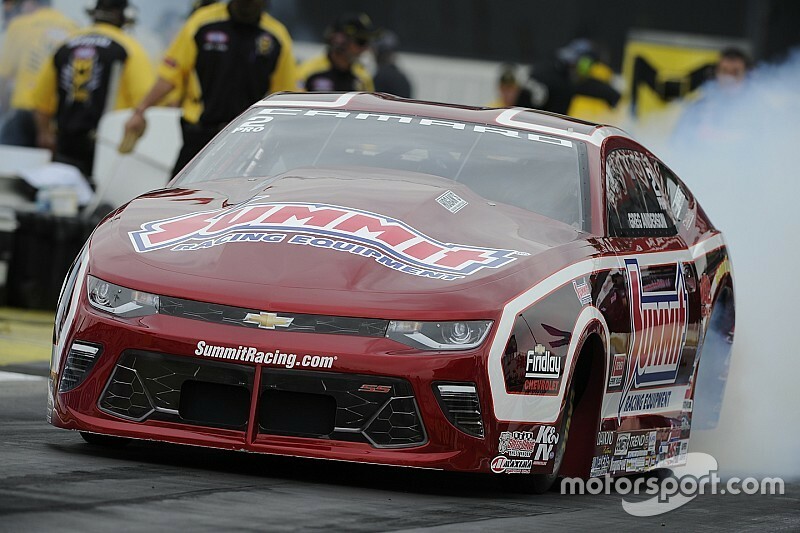 Vincent Nobile, Camaro, 6.579, 210.80; 8. Chris McGaha, Camaro, 6.591, 210.08; 9. Deric Kramer, Dodge Dart, 6.594, 209.46; 10. Tanner Gray, Camaro, 6.595, 211.10; 11. Matt Hartford, Camaro, 6.604, 209.82; 12. Drew Skillman, Camaro, 6.617, 210.21; 13. Allen Johnson, Dart, 6.636, 207.94; 14. Kenny Delco, Camaro, 6.660, 208.62; 15. Alan Prusiensky, Dart, 6.663, 207.88; 16. Val Smeland, Camaro, 7.511, 153.07. Not Qualified: 17. Tom Huggins, 13.474, 69.20. Qualifying for the Circle K Winternationals continues Saturday with the first session set for 12:30 p.m. and second session at 3:30 p.m.